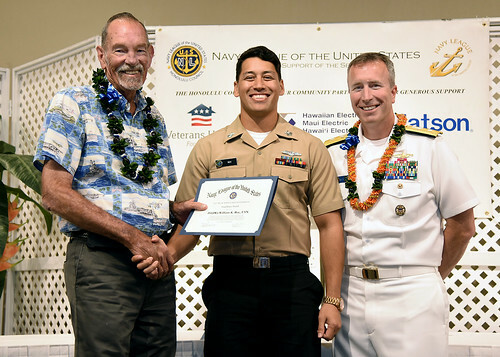 HONOLULU - Four Sailors assigned to Commander U.S. Pacific Fleet (COMPACFLT) staff were honored during the Navy League Honolulu Council’s 57th annual Sea Service Awards held at the Ala Moana Hotel in Honolulu, Nov. 17. The sea service award is the Navy Leagues way of recognizing top performers throughout the sea going services. The COMPACFLT Sailors recognized were: Intelligence Specialist 1st Class William Roy; Yeoman 1st Class Tamar Reid; Electrician’s Mate 2nd Class Randy Corpuz; Lt. Nicholas Ward. Retired Adm. (USN) Richard Macke, president, U.S. Navy League Honolulu Council, kicked off the ceremony with remarks and introduced guest speaker Rear Adm. Brian Fort, Commander, Navy Region Hawaii and Naval Surface Group Middle Pacific who publicly recognized the service members. A total of 52 service members from the Navy, Marine Corps, and Coast Guard were honored for their performance throughout the year. “The award itself is beautiful but to be held in such high regards alongside incredible Sailors, Marines and Coast Guardsman is the true honor," said Roy, COMPACFLT Sailor of the Year.